129 DE BRY, Th. Occidentalis Americae partis. Francfort, 1594. Coll� sur papier fort. - Laid down on strong paper, small marginal repair. Repair of small pinpoint hole on crossing of folds. Small part in right hand margin touching the engraved border, reinforced and printed area re-drawn. Paper very slightly age-toned. Very good condition thoughout. Dark impression. 332 x 443 mm. 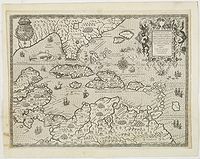 � La carte figure le golfe du Mexique, les Antilles ainsi que la Floride. Elle repr�sente les vaisseaux de Christophe Colomb et donne des indications sur ses d�couvertes. Publi�e dans le livre IV des "Grands Voyages" de de Bry. 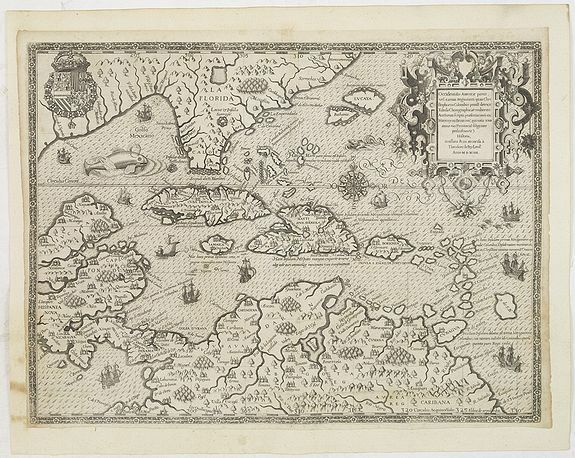 - The most beautifully engraved early map of the Caribbean, including Florida and the Southeast. The map includes representations of Columbus' ships and various notes regarding his discoveries. It appeared in Book IV of De Bry's "Grands Voyages" with text by Benzoni. De Bry's work, more than any other illustrated text up to its time, shaped the way Europeans pictured the New World and its inhabitants during the Discovery Period. Florida is shown flattened in the south after LeMoyne. Repair of small pinpoint hole on crossing of folds. Very good condition. Full margins. - Burden, North America, 83.